Yesterday a nice package came in the mail, was addressed from MarketLeverage. I open it up and it was a really nice Nike gym bag, nice! Feels a little heavy though, so I open it u and it’s loaded with stuff inside. 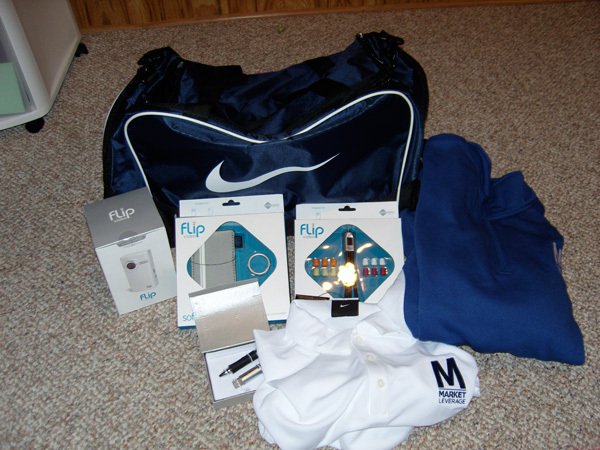 Inside was a Flip video camera, tripod for the Flip, case for the Flip, pen/flash drive, hat, Nike sweatshirt and Nike golf polo, and a blanket. It was pretty cool since I wasn’t even signed up with MarketLeverage until a couple hours after that (hey it worked I’m a sucker I guess). I’m just writing this to say thanks guys! Note this, this is NOT a review of MarketLeverage and I have NOT made any money or tested any of their offers. I would never review a company and praise them if I had not used them. I simply made this post to publicly thank them for the gift they sent me. If I test them out and it works out in the future, I’ll be sure to let you guys know. That’s some neat stuff you got from MarketLeverage. Yea got a package yesterday as well and had to vlog a little thank you. Excellent people and excellent company. Hmm, I may want to trade up my video eyewear for the flip, looks nice! Thanks for signing up as a publisher with us today, and thanks for the good word about your gift pack :) Those Nike Dri-Fit polo shirts are soooo comfortable – they’re what we wear when we exhibit at the trade shows like ad:tech, AffiliateSummit, etc. – will definitely keep you cool this summer! If you need anything contact Erick Bright or I and we will take good care of you! I look forward to seeing you at the next show! I would love to get an interview with you for MLTV. This isn’t a “omg, I’m jealous, I want free stuff” kind of comment (even though I am jealous :P)…but, am I the only one who is NOT impressed at all with all of these goodie packages that ML passed out yesterday? I’ve seen 5 or so bloggers show off what they received from ML, and most of them haven’t even done business with ML, they’re just in the network. Maybe it’s just me, but this stuff rarely impresses me, and it’s even worse when a company obviously unloads on big name bloggers. Think they treat “regular” affiliates that way? Nope, so unless you have a blog, this shouldn’t improve your image of ML at all. I wish I got one of those ;) hah. May have to go apply with them. anyway I see this FLIP everywhere! That was very generous. Did you receive a Flip back with JC did? I was just curious at how often you get presents. I guess there are even more perks to the job. Congrats, This is just one of the reasons why Marketleverage is a top CPA network. Now thats what i’m talking about, free gifts! WoW ! Sweet! . I hope to become a Super Duper Affiliate Like you man! Man, I see MarketLeverage everywhere… personally, I will not be signing up with them though… well, until I get a free package lol! Wow, Market Leverage are really working hard this month. It’s working. Everyone’s blogging about them.